Are you Christian? Were you a Christian before you got married? Is your spouse a Christian? 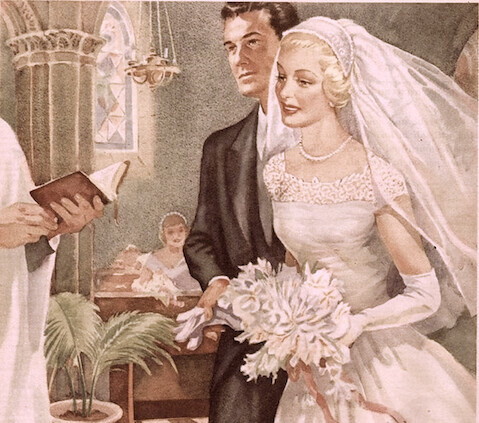 Were they Christian before you got married? If you are a Christian, and you are getting married to another Christian, consider the covenant you are making with God, and your spouse, in front of witnesses. Consider how serious covenants are in the word of God. Consider what it means to make a covenant with the Creator of all things. Don’t take this lightly. There is no right, or guarantee to happiness in marriage. There is no right, or guarantee to feel loved all of the time. Marriage can be years of difficult work, with little encouraging feedback from your spouse. Keep in mind, God is using your spouse, and children for your sanctification, and spiritual maturation. He is also using you for theirs. After all, you are no picnic either. If two sinners get together in a marriage, have some kids, who are also little sinners, and you put them together under one roof, guess what they are going to do… That’s right, they are going to sin. In a Christian home, their should be a war against sin. Kids should be taught right from wrong, parents should teach grace, and forgiveness. Actually live out the gospel in your home, in front of your family. When you get angry, and sin by saying something you shouldn’t have, or by being short with one of your kids, stop, and explain what you did wrong, and ask them to forgive you. They get to demonstrate grace to you. If one of the kids does something wrong, have them sit alone, think about what it was they did, and have them apologize, and ask to be forgiven. The same goes for husbands and wives. It doesn’t have to stop there. You can also do this in your life at work among the unbelievers. They might not understand, but at least they will get a look at it. Inside your marriage are the thoughts, emotions, and desires of two very different individuals who have made a covenant between them, and God, in front of witnesses. It can be hard work, but it is also rewarding. It is the construct in which God has ordained for men and women to enjoy each other, and procreation. It is sanctifying like I said. When you look back over a period of time, and see how God worked in your marriage to grow you, it can be very reassuring, and encouraging. When you see your children grow into young adults, and use what you have taught them to make their way in the world it is a good feeling. Having someone joined to you by God, gives you a sense of belonging, even if you don’t fit in to most social situations. You have someone who has become part of you, and brings completion to you in the traits that you lack. The complimentary nature of the union makes for a more complete unit. Having someone with you while you are sick, or injured is comforting. Being able to comfort your spouse, and feel for them when they are sick, or injured is an opportunity to demonstrate your love for them. Trading off spouses every few years, or forgoing marriage altogether to be promiscuous is not an option for a true Christian. It is not pleasing to God. It is sinful, selfish, and you forfeit so much of what is good in marriage when you look at it from a selfish position. View it as a way to glorify God. Be like Jesus in your selfless, grace abounding love for your family. Let the world see that marriage is serious, wonderful, and God centered. A Review of the Crossway Greek New Testament Produced at Tyndale House Cambridge in Hardcover.